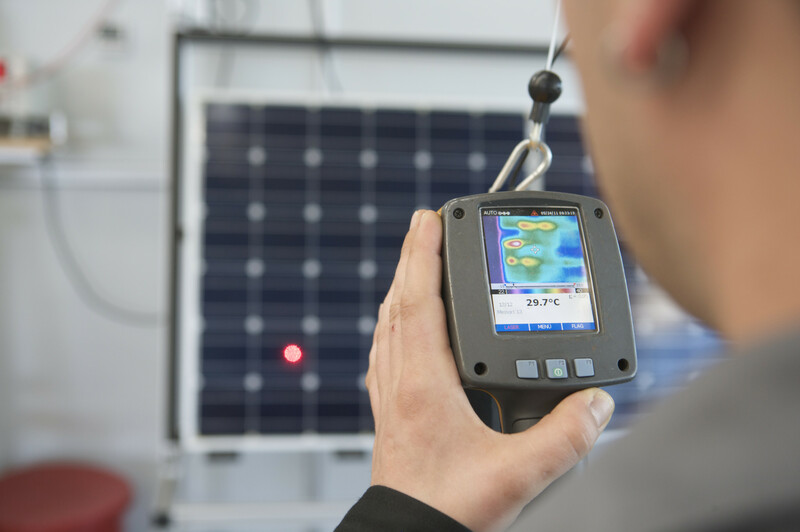 Suncycle offers the following test and inspection methods for photovoltaic systems on the customer’s premises or in our central PV service centre (Germany). Individual test and inspection specifications can be agreed for every order. The results of the analysis can be processed for all photovoltaic components in an open-interface ticket system and provided for customers assigned exactly to every single serial numbers. The modules are integrated in the service workflow per scanner. All identifiable faults are detected and recorded by camera during the optical check and cleaning. These include loose junction boxes, faulty cables, deformed frames, cell inclusions and breakages, delamination, visible hotspots and scratches on the rear. The modules are placed in a water bath and 1,000 volts direct current are applied in this test. Only modules that uphold a resistance according to their surface for 2 minutes pass the insulation test. The test criteria comply with the current IEC standards. The modules are powered backwards during the infra-red test to identify possible weak spots in the cell area, connectors and above all the junction box by means of the infra-red camera (thermal image). The current performance is normally measured for all modules that pass through the PV service centre. During so-called “flashing” (acc. to IEC 60904), the module is flashed with a calibrated flasher and the electrical output is measured (“flashed”) and the power determined under standard test conditions (STC). Damage to the cells can be visualised by means of an electroluminescence test. The module is hereby photographed with three high-resolution NIR-CCD cameras at such a high resolution that even the smallest of cracks are detected. The test documentation comprises images of the complete module and of every damaged cell. This technique allows to detect changes in the EVA film caused by UV radiation in the sunlight. With the UV fluorescence it is possible to identify cell cracks and draw conclusions regarding the age of the cracks. This helps to identify the cause of detected damages.